Designs in .pen format which can be read exclusively by Brother embroidery machines, $5-10 Each, Disney & Pixar Designs, Frozen, Princess, Zootopia, Mickey, Minnie, Pals, Friends, Donald, Goofy, Pluto, Winnie the Pooh, Zootopia, Nickelodeon, Warner, Hanah Montana, Marango, Anita Goodesigns, Dakota Collectibles, Laura Ashley, and More! *Note: files downloaded free or purchased at www.iBroidery.com are in .pen format which can be read exclusively by Brother embroidery machines, just as well as designs in .pes format. New .Pen format is exclusive to iBroidery.com downloads. Introducing iBroidery design downloads exclusively for Brother embroidery machine customers! Choose your Brother Model, Select Hoop Size, Buy Individual Designs for $5-10 Each, or start with Free Monthly Designs. 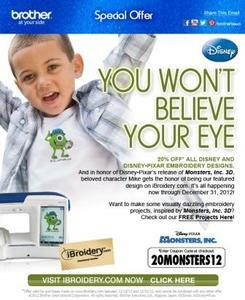 Exclusive downloadable embroidery designs, just for Brother Customers. 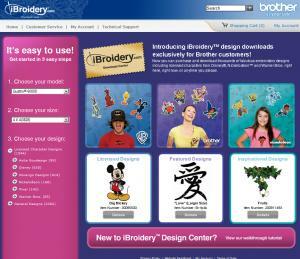 Introducing iBroidery Download Center, the ultimate online retail embroidery design experience. Purchase thousands of designs--some of which have never been offered before--all at a price you'll love. Get exclusive, downloadable licensed designs from Disney. Disney/Pixar, Nickelodeon and Warner Bros, and the latest designs from Morango and Anita Goodesign. Plus, you can reach into the Brother design library and retrieve limited edition designs! Download only the designs you want--no subscription required, and no need to purchase an entire collection of designs! • Create a personal file to include your machine information, contact and dealer preferences, and more. • Create an online archive for the patterns you've purchased as well as a wish list of ones you'd like to buy in the future. 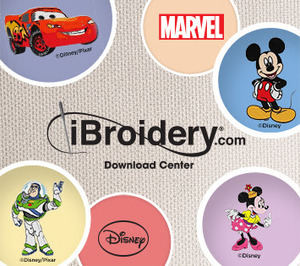 Visit www.ibroidery.com today to see how easy and fun downloading embroidery designs online can be! To start shopping, have your Brother machine model number, serial number and identification number, as well as the name of the retailer where you bought your machine. Click here to visit iBroidery.com now! Disney Frozen Embroidery Designs Now Available!